Within Swedish theatre it was unthinkable to play for kids under five. One thought that it was impossible for them to understand but when the Puppet Theatre Peekaboo/Dockteatern Tittut 1977 began making theatre for children from two years a new era began. Today there is theatre for babies and we know that the newborn child brings both experiences and impressions. 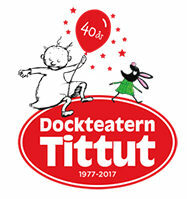 For nearly 40 years, Dockteatern Tittut has created exciting and artistically strong performances. Always with focus on the small child. Many of our visitors debuts as an audience. We have over the years learned how important introduction to the performance is. We always meet our audience in the foyer to create a trust and a desire to get in to the theatre room. We have a great respect for our young audience and make high demands on ourselves to always deliver the best. We work with some of Sweden’s most accomplished puppet makers. We have done productions together with the Royal Opera in Stockholm and Riksteatern. We collaborate with one of the world’s leading shadowplays director, Fabrizio Montecchi. About 60% of our budget is covered by ticket sales. The rest is covered by grants and governmental support.